GPL is not always standing for the GNU General Public License… as this seen on a flower label. It's a company doing "plant novelty rights" called GPL international (http://www.gpl.dk/). They are clearly going into the opposite direction compared to the freedom defined in the well known free software license called GNU General Public License. By the way, if those osteospermum flowers are not F1 hybrid we will be able to keep some good seeds and copy (doing multiplication) of the plant. It's the right to nature to reproduce itself. 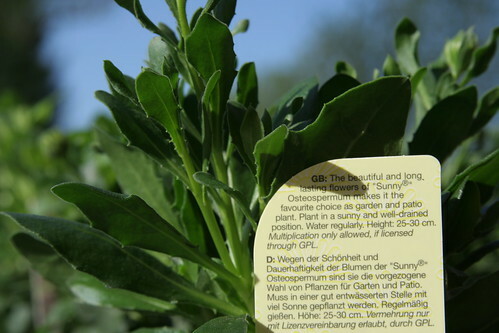 It's the first time I see a company trying to disallow the gardener (as described on their labels, check the photo below) the multiplication of the plant purchased.